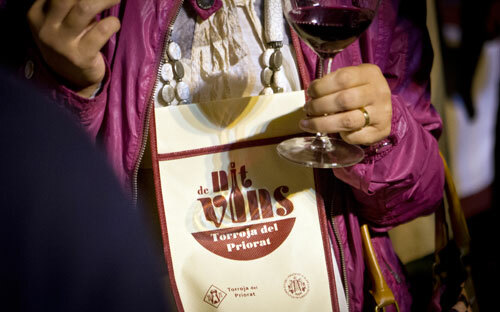 If there’s a sure way to lure people to the remote villages of Priorat, it’s to have an annual festival (or more than one) that features all the wines of a village in a festive atmosphere. 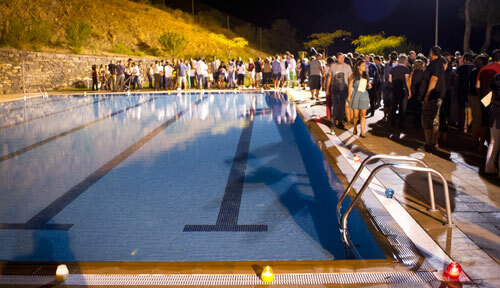 One of such festivals happened last weekend in Torroja del Priorat during the night by the pool, “Nit de Vins” (which seriously needs a website instead of a Facebook friend profile…). But, regardless of this, it’s a fantastic time for anyone interested in tasting the wines of: Aixalà Alcait, Escoda Pallejà, Cristian Francès Breton, Ismael Biosca, L’Infernal, Llicorella Vins, Mayol, Rotllan Torra, Sabaté i Mur, and Terror al Límit. And this year, their featured guests were two cellars from DO Conca de Barberà: Carles Andreu and Vega Aixalà. They set it around what seems to be an Olympic-sized swimming pool that sits just outside the main part of the village with an amazing view of the Montsant mountain range (during the day, obviously). It’s amazing in that a) Torroja, a village of about 250 people has a pool like this b) no one fell in even at 3am after a few hours of drinking and c) we feel like assholes for not knowing about this pool earlier when we stayed in Torroja for a week while presenting the Priorat guide last May. Forgetting about our ignorance, it’s a great setting with a view off to one side of the village and a view to the center of delicious, delicious Priorat wines. Speaking of the wines, one of the stand outs for the night was the Dos Borratxos from Sabaté i Mur which is a solid wine on both price and quality. And according to the Torroja-based online store Prioratonline who was also present, it’s one of their best seller wines. Of course others such as the Costers de Alzina from Aixalà Alcait, Terra de Cuques & Torroja from Terror al Límit, and the new 2011 Palet from Escoda Pallejà were not to be missed either. Naturally, the event should be a success as for those who don’t know, the mayor of the town, Jordi Aixalà is also a winemaker. But don’t worry if you missed it this year. Just pencil it in for next year and make sure to let some high quality wines grace your August.